DNS4Me unlocks your PC's Internet potential by putting you in control of your own Internet services. With DNS4Me, you can associate a static domain name with your dynamic IP address without the hassle. 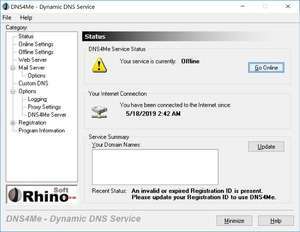 DNS4Me works silently in the background to ensure visitors always reach your web site, FTP server, game server, and much more. Why trust anyone else with delivery of your data? Version 5.2.0.7 is a freeware program which does not have restrictions and it's free so it doesn't cost anything. For security reasons, you should also check out the DNS4Me download at LO4D.com which includes virus and malware tests. Additional screenshots of this application download may be available, too.